As the “Twin Paradox” and Einstein’s Theory of Relativity implied, time travel to the future is possible if enough energy is available. As for time travel to the past, while it seems to be the most envied hypothetical time-travel capability, it also seems to be the only one that is impossible (in my opinion). I will discuss why I believe this to be the case, specifically how it pertains to certain physical laws and theories including: Einstein’s Theory of Relativity, The Law of Conservation of Mass and Energy, and The Law of Causality. One method proposed by some, in order to be able to travel back in time, is to utilize Einstein’s theory of relativity to take time dilation “one step further”, that is, by traveling faster than the speed of light the time dilation may theoretically reverse the arrow of time. To better picture this, recall that traveling closer to the speed of light slowed down the passage of time, and reaching the speed of light appeared to stop it. If time dilation or the deceleration of time were to continue in the direction implied (slowing down to a stop), then continuing this deceleration by traveling faster than light would cause the arrow of time to reverse, thus making time travel to the past possible. Unfortunately this “faster than light-speed” travel would violate Einstein’s Theory of Relativity, as one of the primary elements of the theory is the assertion that the speed of light is the fastest speed that can be attained by anything moving in space. Furthermore, Relativity asserts mathematically that it would take an infinite amount of energy to accelerate a mass (e.g. a time traveler) to the speed of light, which implies that it would take even more energy to accelerate a mass to a speed higher than that of light. Since you can’t have an infinite amount of energy, let alone more than an infinite amount of energy, traveling at or faster than the speed of light is impossible. Relativity aside, if we found some other way to travel back in time and were to able to exist in a previous “version” of the universe, I think that we would violate the Law of Conservation of Mass and Energy, because we as the time traveler would be adding our own mass to a previous version of the universe which should have a fixed amount of mass and energy over time. The only way around this would be to somehow sacrifice matter in the previous version of the universe that one travels to, that is, the time traveler’s body would have to be assembled out of matter already located in the past version of the universe. If this occurred however, we would no longer exist in a previous version of the universe and would by definition have failed to time travel to “the past”. It would appear to be close to matching the past, but it would be a moment in time that had never existed, and the causal chain would be altered beyond what we can possibly comprehend. So time travel to the past appears to be impossible even if this particular law of physics was upheld, as we would be forced to alter the past (in order to satisfy the law) thus preventing us from traveling to a real moment of the past. Finally, if we were to find a way to travel back in time and somehow solve the aforementioned issues, we’d still have a problem with causality. If a time traveler were to go back to the past, and actually exist in that causal chain, the “Butterfly Effect” would immediately change the course of history such that the “present” time from which the time traveler came from would no longer exist. If this was the case, then it seems unreasonable to assume that the time traveler would still have time traveled in the first place. Let’s take a look at a simple causal diagram to appreciate this scenario. From this diagram, we can see that time traveling to the past would create a new causal chain up to and including a new “present”. This new causal chain would no longer be causally connected to the old “present”. This would mean that the time from which the time traveler initially left (i.e. the old present) would no longer exist. Wouldn’t this imply that the time traveler (their sense of self, the “I”, the “me”, etc.) as well as the trip itself never would have been? I see no way around this dilemma. So it appears that time travel to the past is physically impossible for a number of reasons. At least time travel to the future has some promise as it doesn’t appear to violate any of these physical laws and is implied as a possibility due to consequences of Relativity. This type of time travel seems to only be limited by the energy requirements needed to accelerate the time traveling matter to a high enough velocity for a long enough period of time, and return the time traveler back to the previous frame of reference (e.g. Earth). Or if the time traveler utilized the effect of gravitational time dilation, their time travel would be limited by the gravitational field of the celestial body they chose to travel to as well as the time it would take them to get back to the previous frame of reference (e.g. Earth). Either way, time travel to the future is possible simply by moving through space in a particular way. Regarding temporal experiences, it appears to me that memory is the most important of the mental requirements in order to have a mental frame of reference, that is, to make an experience of the past and present possible (as well as a concept of the future). I think that how this memory is stored and retrieved in the brain, the amount or types of memory available as well as the psycho-pharmacological substance-induced or otherwise caused physiological changes to this memory no doubt affect our temporal experiences in profound ways. Memory also appears to transcend physical time by providing a means for experiencing an ever-changing temporal rate. The Theory of Relativity suggests that physical time does not exist for entities moving at the speed of light because entities moving at the speed of light (which is a constant in all frames of reference) have no physical frame of reference, and have an infinite time dilation between themselves and all inertial frames of reference. All physical time for entities that are not moving at the speed of light would be relative to one another based on relative velocity, acceleration, and gravity. Time also appears to pop in and out of existence due to Einstein’s mass-energy equivalence, as matter is converted into energy and vice versa. Thus, both mental and physical frames of reference are needed in order for a temporal experience to exist. As for time travel, it appears to be possible but only if traveling into the future, if we are to uphold the Law of Conservation of Mass and Energy, Einstein’s Theory of Relativity and the Law of Causality. Memory may be one of several mental requirements for any experience of the temporal dimension, but how exactly is time objectively related to the physical universe (i.e. 3D-space)? As I mentioned in the first post, I believe that we can consider time to be a dimension if we find a proper way to relate time to the existing dimensions, such that we have a foundation to work off of. To begin, let’s consider an inductive definition of a dimension so we can at least see one foundation we have for defining our three spatial dimensions. If we start out with an empty space and place one discrete point in it, we can refer to that point as a zero-dimensional object. If we take this object and drag it in any direction, the path it takes can be collectively described as a one-dimensional object (e.g. line, ray, or segment). By dragging this object in a new direction, the path it takes can be collectively described as a two-dimensional object (i.e. a plane). Finally, by dragging this object in yet another direction, the path it takes can be collectively described as a three-dimensional object (e.g. polyhedron, ellipsoid, etc.). In general, we can drag an n-dimensional object in a new direction and collectively describe the path this object takes as an (n+1)-dimensional object. So this is one foundation for our three spatial dimensions. It doesn’t appear to be possible to take this induction one step further, as we have trouble even trying to conceptualize a four-dimensional (or higher dimensional) object. So we can assume for now that our spatial dimensions are limited to a quantity of three. Now this begs the question: How can we reconcile these spatial dimensions with time? Isn’t time independent of space? Not exactly. I believe that time has been reconciled with the three spatial dimensions in at least one way, most notably within Einstein’s Theory of Relativity. Within this theory, Einstein suggested that these four dimensions were unified, and were thus eventually referred to as “space-time”. Up until relativity was discovered, all physical motion and causality in space were seen to operate or progress uni-directionally along an arrow of time (i.e. from past-to-present-to-future) and presumed to elapse at a fixed rate throughout the entire universe. The three extensions of space were our physical universe and the rate of all motion within that space was, or was mediated by, time. So classical physics (i.e. “pre-relativistic” physics) implied that there was indeed an “absolute time” or “absolute present” that existed. It was believed that if a person experienced one minute of time (and even confirmed it with an extremely precise atomic clock), that everyone else in the world (let alone any location throughout the universe) also experienced or underwent one minute of time elapse. To put it another way, it was believed that “clock time” or “proper time” was a 100% objective attribute that was also constant in any frame of reference. Once relativity was discovered, the intuitive concept of an objective (and constant) time was replaced with the much less intuitive concept of a relative time (albeit still objective in some ways). This relativity is demonstrated in several bizarre phenomena including relative velocity time-dilation, gravitational (and other non-inertial) time-dilation, and length contraction. I plan to discuss the first two of these phenomena. It should be noted that one of the main reasons for this physical/temporal relativity and the resultant phenomena is the fact that the speed of light is the fastest speed that anything can travel in space and is also a constant speed measured by all frames of reference. To illustrate the importance of this, consider the following example. If a driver were in a race-car driving at 200 m.p.h. and a bullet was traveling head-on toward the car also moving at 200 m.p.h., a stationary bystander would measure the speed of the bullet to be 200 m.p.h., but the driver would measure the bullet to be traveling at 400 m.p.h. This is because the race-car is moving toward the bullet and thus the velocities (car and bullet) are additive from the driver’s inertial frame of reference. The impact on the car would be the same (ignoring wind resistance) if the car was stationary with the bullet moving towards it at 400 m.p.h., or if the car and bullet were traveling towards each other at the same speed of 200 m.p.h. If we replace the bullet in this example with a pulse of light, this additive property of velocities disappears. Both the race-car driver and the stationary bystander would measure the light pulse traveling at the speed of light (roughly 300,000 km/s), although the frequency of the light pulse would be measured to be higher for the driver in the race-car. It is the time dilation that compensates for this, that is, time appears to pass by more slowly for any frame of reference in motion relative to the observer, such that the “additive velocity” paradox is resolved. If both the driver and the stationary bystander were holding clocks that the other person could see, both would see the other person’s clock as ticking more slowly than their own. It makes no difference whether we say that the driver or the bystander is the frame of reference that is “moving”. The point is that there is motion relative to one another. If we start the observations after the driver has reached a constant speed, we could just as easily assume that the race-car driver is “stationary” and it is the bystander, race track, and earth that are “moving” relative to the driver. Motion is relative, and thus time is relative as well. This temporal relativity is a concept that goes completely against all common sense and everyday experience, but has been empirically verified to be true many times over. As opposed to the example with the race-car driver traveling at a constant speed of 200 m.p.h., the consequences of relativity are dramatically different when any of the frames of reference under consideration are non-inertial frames of reference, that is, if the frame of reference is accelerating (i.e. non-inertial) relative to any other. When non-inertial frames of reference are considered, relativity has much more bizarre consequences. The most bizarre example of non-inertial frames of reference, coinciding with the Theory of Relativity, is that of the supposed “Twin Paradox” or “Traveling Twin”. There are two basic versions of this story, so I’ll start with the most commonly used. Let’s imagine that there are two 20-year old identical twin sisters, Mary and Alice, where one twin travels into outer space (e.g. Mary) at near light speed and the other remains on Earth (e.g. Alice). It just so happens that the speed that Mary was traveling at, in combination with her non-inertial motion (i.e. acceleration) when leaving and when returning to Earth, caused a permanent time dilation such that she aged less when she finally returns to Earth (faster travel speed creates a more noticeable effect). Let’s say that at some point Mary stops her journey in outer space, turns around, and eventually makes it back to Earth with Alice having waited for 50 years. We can also assume that Mary traveled at a speed such that she has only aged 1 year by the time she returns to Earth. Alice is now 70 years old, but Mary steps off of the space shuttle and is only 21 years old! It is worth noting that both twins experienced their time elapsing in a normal fashion (i.e. neither of them would experience a feeling of time moving in slow-motion). To both Mary and Alice, nothing strange is going on as they wait. Mary ages one year and Alice ages 50 years. We can define the “time” that Mary experiences (or observes passing by on her clock) during her space travel as the “proper time”, while the “time” that Alice experiences (or observes passing by on her clock) on Earth as the “coordinate time” (the “proper time” within a defined stationary frame of reference). It is the relative difference between these two times that is the measured time dilation. This time dilation is one of the consequences of relativity and it demonstrates a very clear relationship between space and time. What I find most amazing is that the only requirement to accomplish this “time-travel” to the future was the ability to move through space at high enough speeds (and return back to the stationary reference frame). This would require large amounts of energy, but the point is that it is physically possible nevertheless. It should be noted that this same result could have been accomplished if the traveling twin (i.e. Mary) simply went to a planet that had a significantly larger gravitational potential than that of Earth. Any non-inertial frame of reference, whether due to a changing velocity or due to gravity, produces this time dilation (and future time travel) phenomenon relative to any inertial frame of reference. The “Traveling Twin” scenario illustrates several interesting things about our universe. It shows that physical time as well as temporal experiences are elapsing at different rates across the entire universe as a consequence of Relativity. It also suggests that rather than existing independent of us, time actually “travels with us” in a way because it is unified with the space we are moving through (and how we move through it) as well as the curvature of that space due to gravity. In my opinion, since the time dilation is infinite if the velocity of an entity is equal to the speed of light, this suggests that no time exists for anything moving at light-speed, that is, the proper time is zero even if the coordinate time (of a sub-light-speed frame of reference) is infinite. This may imply that all bosons (e.g. photons, gluons, gravitons, etc.) exist with no proper time even though an infinite amount of time may have passed for all inertial frames of reference. So time does not appear to exist for all entities, only for matter (e.g. fermions, hadrons, etc.). For those that are familiar with Einstein’s mass-energy equivalence, we can see that photons with sufficient energy can give rise to matter/anti-matter pair production. For example, two gamma ray photons can combine to form an electron-positron pair. This means that particles traveling at the speed of light (e.g. photons) can combine to form matter which travels much slower than light. If this is true, then particles that exist with a proper time of zero can change to particles that exist with a non-zero proper-time, that is, due to the pair production, the proper time becomes non-zero and thus time is created (due to a reference frame being definable at sub-light-speed) as soon as bosons are transformed into matter. If proper time is limited to matter, then temporal experiences must also be limited to matter, as no processes or experience can exist if there is no proper time elapsed for that experience. There is a flip side to this coin however. Let’s say we take the aforementioned electron-positron pair that was produced and they are re-combined within a certain range of momentum, etc. They will collide, annihilate each other, and two gamma ray photons will be produced. So, as matter is transformed into energy (e.g. photons, etc. ), time is destroyed in a sense (due to the absence of a reference frame at light-speed). Thus, matter and photons are interchangeable and that means that proper time (a requirement for temporal experiences) can “pop” in and out of existence for the entities considered. Thus there appears to be no conservation of proper time (unlike mass and energy which must be conserved in a closed system). If we imagine all matter transforming into a form of bosonic energy, and thus all proper time disappearing, this lack of conservation of time becomes quite clear. In this post, I will consider some of the objective and subjective elements of time, including some requirements, and how they relate to temporal experiences. I think that it’s safe to say that time involves both a mental and physical component which is evident when we recognize the lack of consistency between our subjective or mental experience of time relative to an external objective standard (i.e. “clock time”). It is this objective standard that most people call “time”, although there are quite a few people that consider the subjective experience of time to be the only “time” there is. Some believe that time is an illusion, that is, that time itself or the arrow of time that we experience is nothing more than an experience and doesn’t exist outside of consciousness or otherwise. I’d rather simply focus on what we experience and how it appears to relate to the physical universe. For the purposes of this post, we can assume that time exists in some objective way and we are able to experience it in a subjective way. Keep in mind that these posts are just some of my recent thoughts on time based on what I’ve read as well as my own two cents on the matter. Anyways, here begins part 1 of this essay. I think that the most important mental requirement for a temporal experience is memory (storage and retrieval). I think that memory provides a mental frame of reference, which seems to be necessary in order to have some concept of the past, present, as well as a concept of the future (albeit through inferences made from the past). In addition to a mental frame of reference, I also think that a physical frame of reference is necessary for a temporal experience since “clock time” or “proper time“, which appears to govern the speed of all processes (including mental processes), is dependent on this reference frame. It is these physical and mental frames of reference that allow time to exist both objectively and subjectively. Together these two frames of reference appear to be what mediates a temporal experience. If an entity had no memory, I don’t think it could have any experience of time because there would be no way to relate one moment of thought, sensation, perception, etc., to a previous moment, that is, there would be no “mental relativity”. It is memory that serves as a mental frame of reference from each moment of time to the next, thus allowing a sense of causality or change, that is, a sense of time. Can a temporal experience occur with out a sense of change? I don’t think it can, but if I hear a compelling argument that suggests otherwise, I may reconsider. As for how much memory is required, I don’t think that there is any minimum amount of memory needed, so any arbitrary amount should suffice. After all, some insects may only have a 30 second memory span (or less), but I see no reason to believe that even with a memory span as short as this (or shorter) that the insect is incapable of any kind of temporal experience at all. Thus, it seems reasonable to believe that there should be no minimum amount of memory required for this experience, as long as there is at least some memory. If memory is truly required for a temporal experience, then it should be clear that different temporal experiences can result from storing, retrieving, or processing those memories in various ways as well as increasing the amount (or type) of memory that an entity possesses. For simplicity, I will limit my use of the term “memory” to that which is present in brain-utilizing living organisms (as opposed to that of A.I.). If memory is stored and/or retrieved differently (e.g. method used, rate, etc. ), it may lead to the experience of time passing by or having passed by at different rates. I think that this subjective temporal “rate” is another important feature of the mental frame of reference that memory seems to produce, and I also think that this temporal rate is at least partially a function of change in some kind of a temporal baseline over time. I’ll explain more about this theory in the points that follow. Psycho-pharmacological substance-induced or otherwise caused physiological changes to a brain could very well be associated with a change in this “mental relativity” or “temporal baseline” and thus could produce a far from normal temporal experience. When I use the term “normal” to describe a temporal experience, I am defining it to be the feeling of time passing by at a normal rate, that is, there is not a significant change made to the previously established temporal baseline (which I’ll explain shortly). I want to point out that while someone may feel that time isn’t passing by at the same rate that it once did years ago, I want to distinguish any short-term temporal rate changes from the long-term temporal rate changes. For now I also want to focus on the idea of a temporal baseline and how it relates to short-term, or working, memory. I believe that we establish this temporal “baseline” (i.e. “mental clock”) over time based on our duration of physiological constancy (and most importantly the memory or record of it), and thus is more easily defined when physiological changes are relatively small for extended periods of time. One could analogize a well defined temporal baseline as a mental clock that has been synchronized such that the temporal experience feels normal. When the physiology of memory and other brain processes are changing less over time, this rate of resynchronization slows down until it approaches a state of synchronicity (a point in time after the absolute-value derivative of physiological change falls below some threshold similar to the “Just Noticeable Difference” or JND). To illustrate this idea, let’s assume that the following graph represents a physiological change over some interval of time. 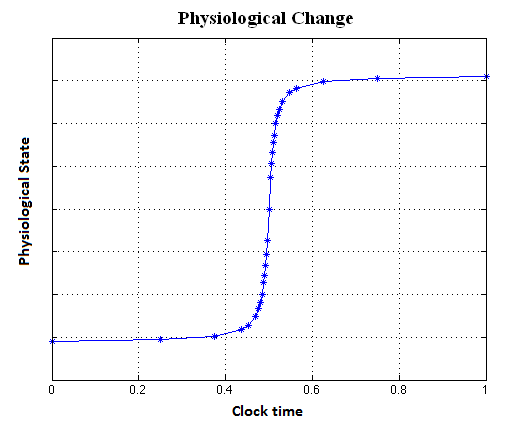 As you can see in the graph above, a physiological change is shown over a time interval of one second. I omitted labeling the y-axis with any metrics or units since physiological changes can be quantified in numerous ways. If one were so inclined, the concentrations of certain chemicals in the brain or the speed of certain mental faculties could be measured and used as a quantifiable metric. Regardless of the units or metrics used, the idea here is that a physiological change in the brain starts to occur at some rate (which may be seen as the start of a temporal incoherency or baseline shift), gradually increasing to a maximum rate (when t = 0.5 in the graph above) and finally slowing down until the new physiological state is established (coinciding with a temporal baseline re-synchronization). My theory is that as the rate of physiological change starts to decrease, the temporal baseline starts to re-synchronize. Even though the physiological state is not what it used to be, as long as the amount of change is decreasing, the new physiological state will eventually feel “normal” as the previous state did. So we could say that during the time interval where the absolute-value derivative of the physiological change curve is above some “Just Noticeable Difference” (JND) threshold, we experience an abnormal temporal rate and vice versa. The derivative of this curve, f ‘(x), might look something like what is displayed in the graph below. 1) A temporal experience provided by memory is not fixed as the physical or objective passage of time is (i.e. “clock time”), that is, an entity’s temporal baseline is always changing (resynchronizing after a physiological change to memory occurs in order to return the temporal experience to a state of “normality”) which means that we don’t experience time elapsing at a constant rate, even if it is a constant rate according to a physical clock. 2) Memory can store certain aspects of an event such that they are accessible in the future whereas physical time passes such that certain aspects of “the present” are eventually and inevitably inaccessible as “the past”. I think that number one (listed above) seems reasonable based on our experience. If you’ve ever ingested a mind-altering drug (e.g. caffeine, nicotine, alcohol, pharmaceuticals, THC, psilocybin/psilocin, etc.) or felt extremely tired or hungry, you may remember how time did not pass by in a normal fashion. Stimulants have been known to increase our estimation of time intervals (i.e. increase our subjective temporal rate), whereas depressants have the opposite effect. It has even been shown that by simply increasing the temperature of our brain (even unintentionally with a fever), that we tend to over-estimate the rate of time elapse, presumably due to the fact that the speed of all chemical reactions remain proportional to temperature. However, if one was in a particular physiological state for a long enough time, it may start to feel increasingly normal. If one returns to a previous physiological state (e.g. after the drug wore off, after sleeping, after eating, etc. ), more than likely time passed by in an abnormal fashion once again until you adjusted to that new physiological state (re-synchronized your temporal baseline). I should note that for number two (listed above), in theory, we may have some access to the past by inferring it based on reversing the deterministic causal chain we are aware of. However, we are only aware of a limited portion of that causal chain and memory provides the possibility to instantly retrieve aspects of the past which are otherwise not easily (if at all) accessible to us. On top of this, the implied randomness that exists within the quantum realm suggests that we can’t predict a reversed causal chain beyond some level of determinism. Matters become even more complicated when we take into account the fact that our bodies are trying to restore some sense of equilibrium and respond to physiological changes in the brain by taking chemical compensatory measures. The important point here is that if one is in a new physiological state that is not changing much (i.e. minimum compensatory measures taken by the body, intake versus metabolism of a chemical/drug is nearly constant, etc. ), we can start to feel normal, even if our new state is not the physiological state that we previously identified as “normal”. While our temporal experience may vary due to physiological changes, physical and mental (i.e. subjective) elements of time are definitely correlated with one another. If you double the rate of physical time elapsing (i.e. “clock time”), it should also double the subjective duration of the temporal experience, even if that subjective duration (which I believe may be mediated by some temporal baseline) can never be quantified or measured. 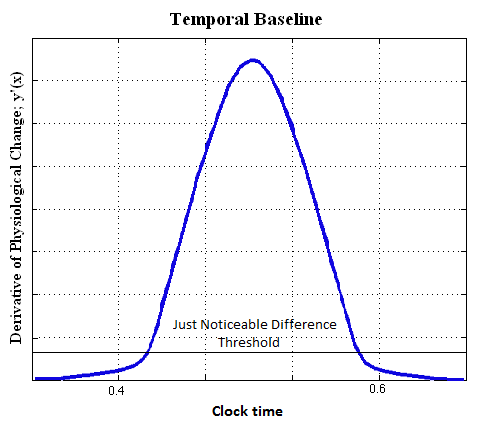 For example, if a human brain produces a temporal experience that feels like one hour but in actuality only one minute of “clock time” has elapsed (based on the entity’s temporal baseline), then two minutes of elapsed “clock time” should be correlated with a temporal experience that feels like two hours (assuming the baseline hasn’t changed significantly during this time). While this may seem obvious, I think it’s important to note this correlation. Increasing the amount of memory an entity possesses, that is, by increasing the range between the earliest accessible memory and the most recent and/or increasing the amount of information stored within that range should also be correlated with a unique temporal experience. If we compare humans that have lived for different lengths of time, we can see how the amount of long term memory acquired suggests that they are having different long term temporal experiences. The number of long term memories would vary from individual to individual, and it would seem that by living longer, one would also increase the range between the earliest accessible memory and the most recent. I would expect this to be associated with differences in their temporal experiences. For a 100 year old individual, one year passing by would only be another 1% of the total objective time experienced, where in the case of a 1 year old infant, one year passing by would be another 100%, or an effective doubling, of the total objective time experienced. In other words, as we age, each day that passes by becomes a smaller and smaller percentage of the total number of experiences. This suggests to me that subjective time probably passes by more slowly when there have been a smaller number of memories accrued and vice versa. I’ve heard many times before that as you age, time flies by, and I think that this is at least one factor involved. For those that have doubts about subjective time passing by at different rates as you age, try to think back to when you were a child and you thought that it would take “forever” to turn 18 years old. Once you became an adult however, more than likely your experience of time began to speed up a little. There are certainly other factors involved with this age-related change in subjective temporal rate. For example, in the case of humans there seems to be a decrease in the amount of day-to-day change as we age due to the routines that we start to follow as well as the decrease in exposure to new information and novel experiences, thus making one day harder to distinguish from another. If this is true then memories may somehow begin to “blend” together or compress into a representative albeit truncated temporal chunk, or it could also be the case that less memories are stored altogether due to the lack of novelty within the redundant experiences. If a novel experience somehow tags an event such that it is remembered better, this may be analogous to looking at our mental clock more frequently (e.g. t = 1, t = 2, t = 3, t = 4, t = 5, etc.). When an experience is redundant, there is little or no tagging involved and this is analogous to infrequently looking at our mental clock (e.g. t = 1, t = 5, etc.). This would mean that over time our attention to time based on memories decreases. There is also a decrease in the number of age-related goals since an adult is no longer age-restricted from drug and alcohol consumption, driving privileges, watching R-rated movies, etc. In this last example, it seems reasonable to assume (based on our experience) that when we are expecting a positive stimulus at some known time in the future (e.g. an age-related privilege, positive reinforcement, etc. ), that the rate of time passing by feels reduced. On the flip side, when we are expecting an unpleasant event to occur at some known time in the future (e.g. an obligation, negative reinforcement, etc.) we may expect to feel an increase in the rate of time passing by. So how we mentally or emotionally tag events appears to affect our temporal experience as well.